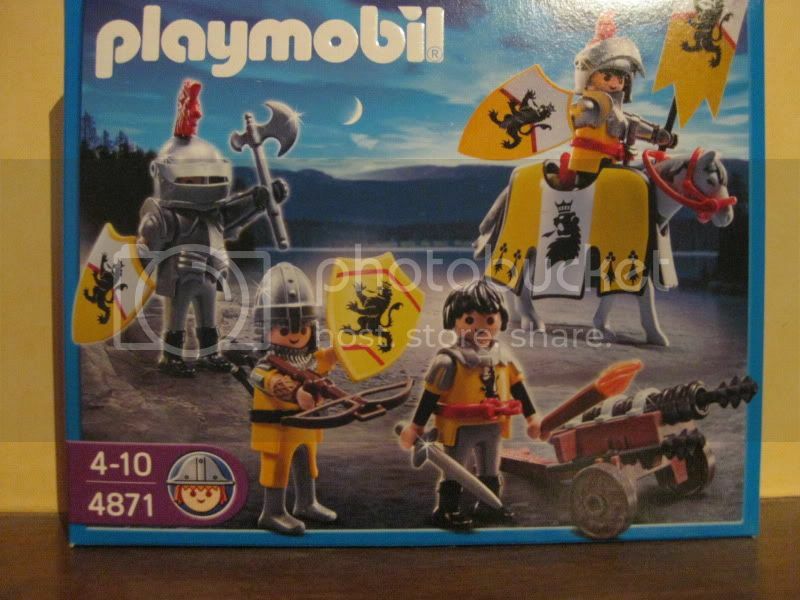 I am really excited about the new knight sets and purchased a 4871 to go up against the 4873 I reviewed earlier. There are many things I would have done differently in this set but don’t get me wrong, I think it’s a real good one and at 14 Euros it’s at a very nice price point! If you look at the box cover you see that this fabulous Lion knights are traveling east (right) where as the evil Falcon knights were going west (left) so clearly they are on a collision course! However I don’t think 2 vs 4 is a fair fight…have to get me some more Falcon knights! The back of the box shows everything in much more detail and there are already so many remarks I want to make. But I will refrain for now and will get to that in the more detailed pictures. In the following picture you see the contents of the box. 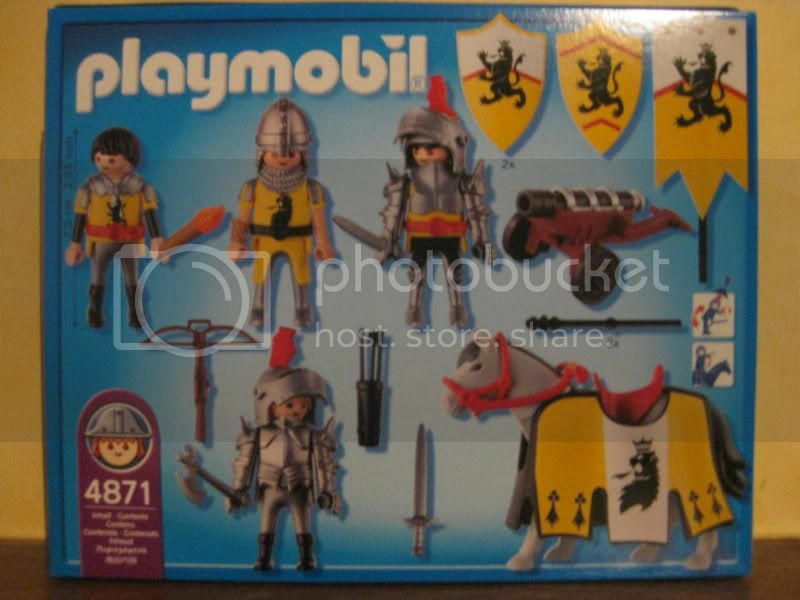 Here they are in all their glory: three bags of playmo goodness, a horse, a horse coat and a pole. 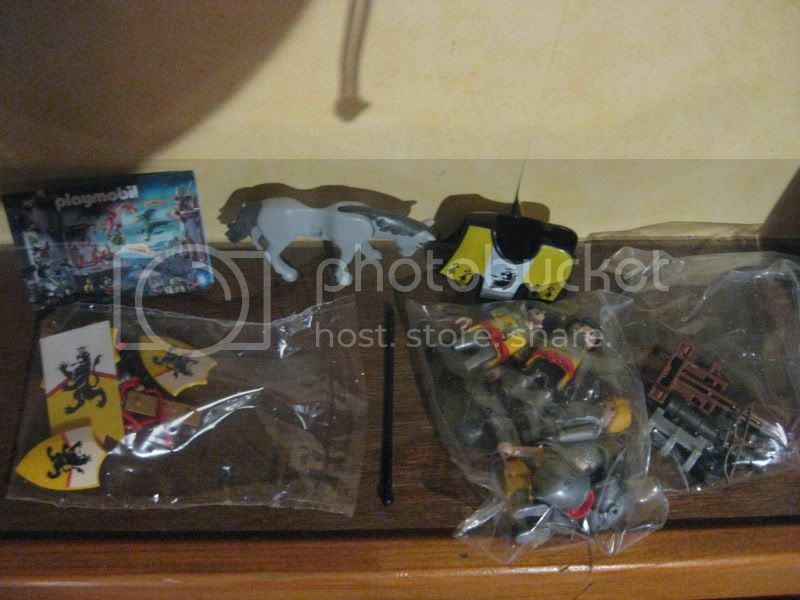 Here is an overview of the unbagged things together with the contents of the first bag! Here is my first major gripe with this set in particular, but there have been sets before with the same issue. If you make a set with a horse coat, please please please also have an accompanying head cover for the horse. What do you guys think should there be a yellow or white head cover for this horse, or maybe even black? I think yellow, but why can’t they make some form of matching head cover UGH! The weapons are simple and straight forward, two swords and one axe, nothing to see moving along. There is also a torch to light the cannon like thing and a arrow holder thingy. The new shields are a thing of beauty, I really like the shape ! There is also a new feature on the back as the piece which the klicky holds can also be turned (see the second (blurry) picture). Finally the banner is very nice, I like they made it in fabric and not plastic. The second bag contains the klickies and their "wearables". Let’s get the easy part out of the way first. There is a leather arm greave for the crossbow man; it’s a useful piece, nothing fancy. 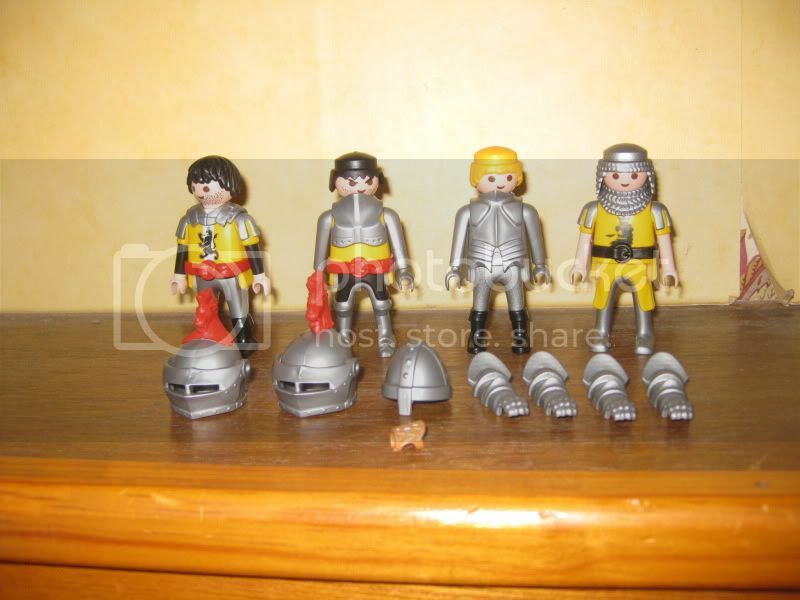 There are three helmets, the two on the left ones are knight helmets that we have seen many a time but they added little red lion figures to go on top. I think it’s nice so I am happy with them. The next one is the standard conical helmet with a nose-guard added. I think this is one of the best helmet designs they have done in a long while and I think I will order some more from DS! 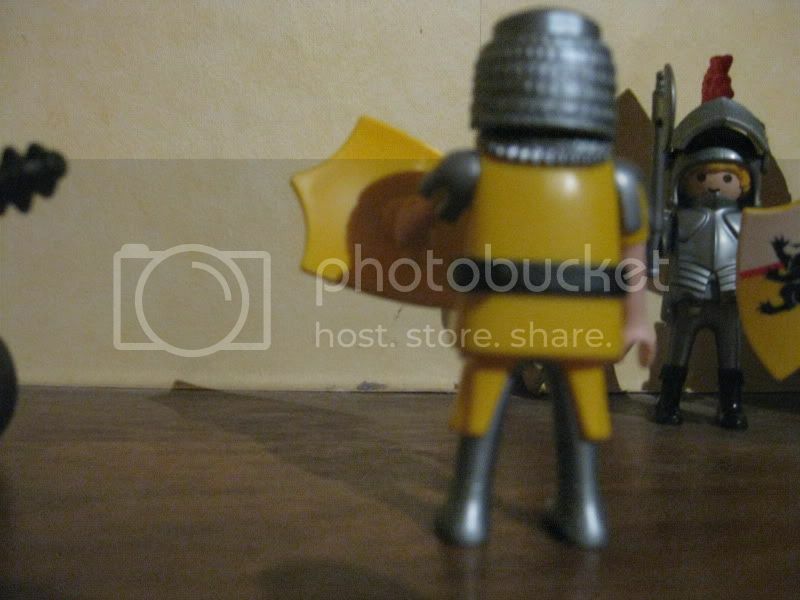 The two knight figures also have arms greaves. I think they are a new design, but nothing that creates a WOW effect. Then we come to the meat of this set, the klickies, let’s go through them from left to right. The klicky on the left is the cannoneer. Overall it is a very good design and there are lots of useful stuffs for customizing. 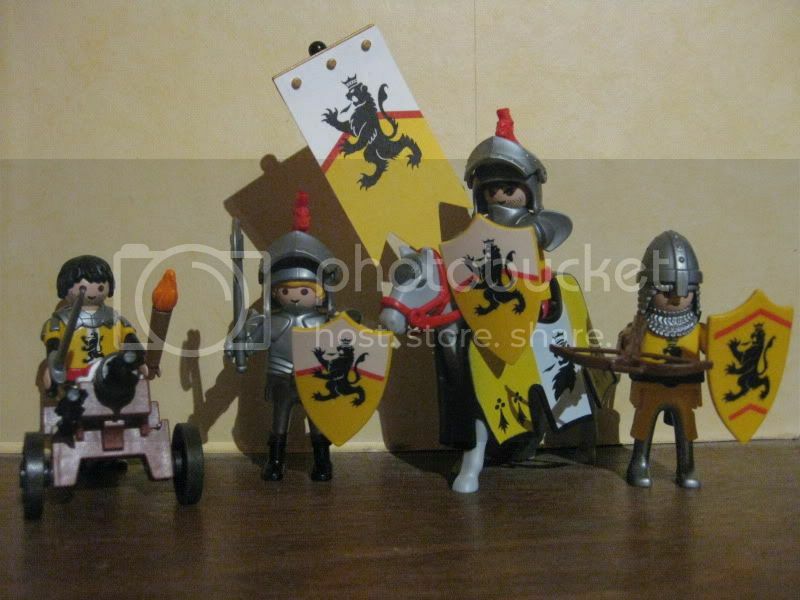 However why oh why would soldiers in the middle ages NOT WEAR A HELMET??? Oh well, it’s easily fixed, but I really don’t understand. The next one over is a piece of work. Why these angry eyebrows on one of the good kings man? The legs though are great, AFAIK they are a new design it’s a slightly shorter split skirt but with the legs have more detailed armor. I will be posting a custom with these soon, because I think they are very well done. But why oh why does it have a black split skirt when you have a yellow torso is beyond me. The armor he is wearing has already been discussed here and there are lovers and haters so let’s leave it at that! And know we come to one of the best piece in the set. Just like the figure in 4873 this klicky lacks the faction’s crest, which I assume is done so kids can use it for whatever. 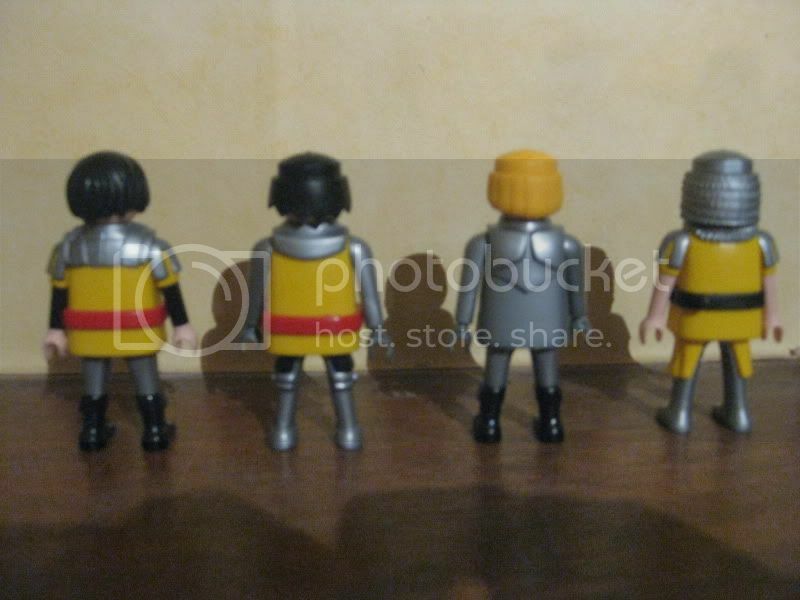 This klicky has full plate armor though is what I think is one of the best pieces in this set. It is part of the klicky but it goes all the way to the bottom of his torso, it only covers the top part of his back though so that is still slightly unfortunate, but I am sure I will be able to put this to great use. 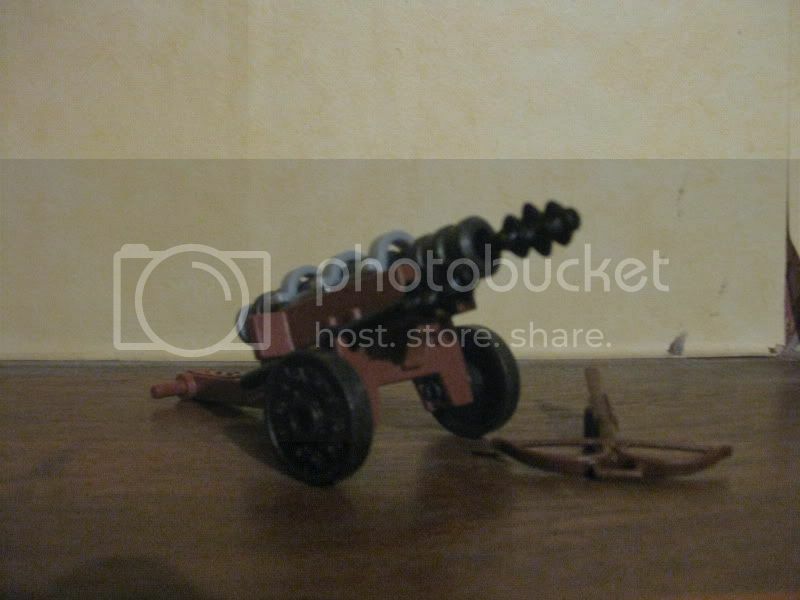 And finally we have the cannon and the crossbow. I know they used cannons in the latter half of the Middle Ages; it’s just not for me. So I will happily put these aside and never look back. The new shooting mechanism is not as much fun as the old anyway so I think a lot of kids will be disappointed. The crossbow is of standard design. And finally we have the fully assembled troop. Like I said at the start, even though there are many things I would do differently I think it is a marvelous set and I am sure that I will buy more of them! The cannon looks pretty cool, though I am a sucker to anything with wheels! 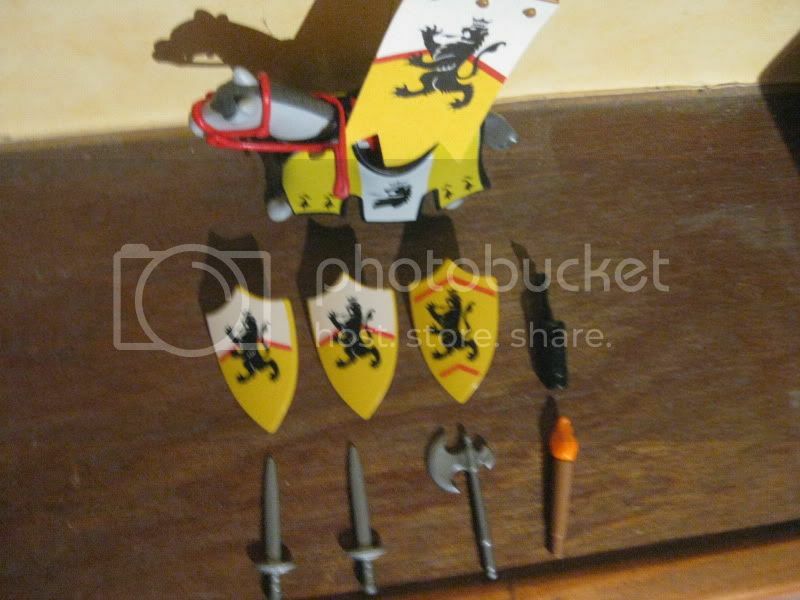 Thanks for the review-nice job!I really like these guys too, already formed me a little company of about 60 men-they even look better in larger numbers!I love the-finally!-more realistic looking heraldry too! I agree with you regarding the archer: the best looking figure in this set. Not that crazy about the rest I'm afraid. I'll still get some though, for customising. About the two "armoured" figures-try changing their legs, switching them.I did, and they look WAY better imho! Swapping legs might work - yes. But again, this brings us back to what we were discussing some weeks ago. Why do you have to swap the legs of a new set in order to make the klickies look better? Isn't that what the PM design team should do? Why are some things obvious to us but not to them? You're right about that!It's like the "gold-legged" crusader special a few years ago...never understood that either. Lovely pictures~!!! I dont have the time to got ttrough your review now Gis (will do so once I get home) but the blonde knight's torso looks very interesting!!! Its a new mold is it not? ?